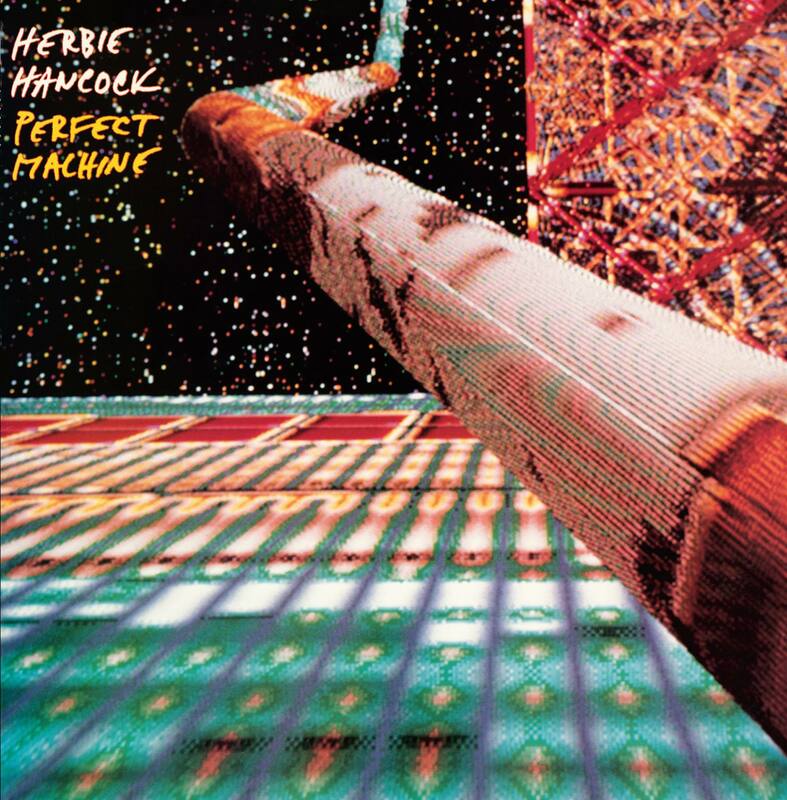 “Almost four years after Sound System, Hancock hooked up with Bill Laswell again for another project that would mark his final release on the Columbia label, Perfect Machine. This time, the duo co-wrote the bulk of the tracks with Bootsy Collins (of Parliament/Funkadelic fame) and the former vocalist of the Ohio Players, Leroy “Sugarfoot” Bonner. Apart from Hancock, Collins on bass, and Bonner on vocals, the stripped down personnel includes Nicky Skopelitis on Fairlight electronic drums, Grand Mixer D.ST. on turntables and effects, and Mico Wave on Minimoog bass, talk box, and Vocoder. The album is more minimalistic than Future Shock and Sound System, while retaining a Kraftwerk-influenced sound and production value. The sparse, but pulsing beats etched out on a Fairlight computer with huge sounding samples, are layered with bleeping, arpeggiated synth chords, industrial sounds, and turntable scratches. Produced by Bill Laswell/Material and Herbie Hancock. Recorded by Robert Musso at Quad Recording Studios, N.Y.C. and Garage Sale Recording, L.A. Mixed by Robert Musso at Power Station, N.Y.C. Roland MKS-80 Super Jupiter – Made in 1984, this synthesizer is a refined Jupiter 8 in a standalone module. It had no keyboard connected to it, and any instrument run through this synthesizer was done so using external cables. It was used by Herbie on Perfect Machine. Yamaha DZ7llFD – This updated version of the DX-7 held 64 voices in internal memory and another 64 voices in a RAM/ROM cartridge that could be accessed. In dual mode, one could layer these voices in different combinations and create a variety of sounds not available on the standard DX-7. This instrument was used by Herbie on Perfect Machine. Yamaha TX-816 – A digital synthesizer that takes its form as a rack unit simulates having eight DX-7s in one. This allows a musician to store and carry as many sounds as they like without needing several instruments to create them. It also features eight audio outputs and is compatible with all other DX synthesizers. Herbie used this on Perfect Machine. Kurzweil K-250 – First released in 1984, this sampler synthesizer was able to produce sound derived from sampled sounds without the need of a disk drive. It featured both acoustic and ROM sounds built in with twelve-voice polyphony. Herbie played this instrument on Perfect Machine in 1988. Oberheim Matrix 12 – Released in 1984, this polyphonic analog synthesizer is known for producing one of the best sounds available. It has an ability to produce an almost limitless variety of sounds. This was used on Herbie’s 1988 album Perfect Machine.